This Multigrain Sprouted Flour is made from Green Gram, Wheat, Flax seeds, Cow pea, Maize, Sorghum, ..
Sri Sri Tattva brings you Whole Wheat Atta (Flour). Each kernel of wheat used in this atta is picked..
Our Natural Coconut Flour is an excellent non grain alternative made from naturally grown fresh coco.. While we work to ensure that product information is correct, on occasion manufacturers may alter the..
Graminway Tapioca Atta is a starch obtained from Cassava root. Tapioca is staple food for millions o.. This traditional flour mix is as nutritious as it is delicious. So we decided to innovate and make a..
Graminway Rajgira Ka Atta is obtained from Rajgira/Ramadana (amaranth seeds). It is an ideal source ..
Graminway Gujarati Thepla Atta is an authentic gujarati bread mixture which is gaining popularity be..
Multigrain atta is a source of protein and fibre derived with an innovative mixture of grains to kee..
Graminway Rajasthani Missi Atta is a traditional Rajasthani bread made with fine quality of whole wh..
Graminway Healthy Atta is made with best ingredient such as Rajgira atta, jowar atta, roasted channa.. Enjoy the goodness of farm fresh Maize flour with its absolute pureness and freshness. These golden ..
Our proudest presentation and most innovative range is the blended flour range. Multi millet atta is..
Graminway Multi Millet Atta is made with 5 millets - Jowar, Bajra, Ragi, Navane, and Little Millet. ..
Graminway Daal Poori Atta is also popularly known as Bedawi poori, which is made of whole wheat flou..
Come fall in love with food all over again, To be able to eat as much and feel good about it happens..
Graminway Bhatura Atta, famous breakfast from Punjab and Delhi, is made of refined flour. Bhatura is..
Graminway Barley Atta is made from finest barley grain, It is dried and then grounded. It is popular..
Graminway Masala Poori Atta is a delicacy from northern part of India made on special occasions. Att..
One of the oldest consumed grains in the world, barley is one of the healthiest food. The Nutty Yogi..
VIJAYA FOODS Sorghum Popped Flour is a healthy, gluten free replacement of your daily breakfast or s..
How do you choose flour that is perfectly suited for you? 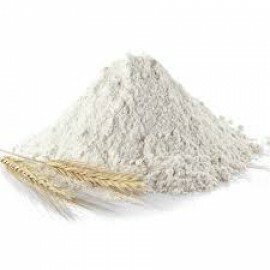 Different flours have different super powe.. Nutty Yogi brings to you the millets like bajra for daily dash of health. Though humans started grow..